CONSIDERABLE: Areas with dangerous avalanche conditions exist on drifted upper and mid-elevation slopes. Beware of large unstable cornices and slopes overloaded by wind drifted snow. Dangerous human triggered avalanches consisting of wind drifted snow and failing on a buried persistent weak layer remain likely in some places. You can find safer conditions, LOW danger, and pretty nice powder at lower elevations and on lower angled slopes. Make conservative decisions and evaluate snow and terrain carefully. Avoid and stay out from under large ridge-top cornices and steep slopes with recent or previous deposits of wind drifted snow. Dangerous conditions exist on drifted upper elevation slopes, but you can find nice snow and safer conditions at lower elevations, on lower angled slopes, and in sunny or sheltered terrain. We found mostly stable snow and very nice fast shallow powder conditions at lower elevations in Logan Canyon yesterday. The Tony Grove Snotel at 8400' reports 11º F this morning and there's 71" of total snow containing 97% of average SWE for the date. It's 7º F, at the 9700' CSI Logan Peak weather station. South-southeast winds are increasing this morning and are currently averaging around 28 mph, with gust around 40 mph. A weak storm system will pass through the region today. A second stronger and colder storm system will impact much of Utah Sunday into Sunday night, then continue across northern Utah Monday. The active pattern will continue across the area later in the week as a new storm system crosses the state on Thursday. The NWS has issued a Winter Storm Watch for the Utah mountain north of I-80. Today in the Logan Zone, it'll be mostly cloudy in the mountains, with 1 to 3 inches of snow this afternoon. Low temperatures at 8500' expected to be around 24º F, and 11 to 17 mph southeast winds. Wind chill values of -20º F at times! Tonight, temperatures will fall to around 9º F and 16 to 18 mph south-southwest wind will cause wind chills around 8º F below zero. 2 to 4 inches of accumulation is forecast. Snow is likely tomorrow afternoon, with 3 to 5 inches of accumulation possible, high temperatures near 25º F and 18 to 26 mph south southwest winds, with 40 mph gusts. I could see blown-in and covered up evidence of fairly extensive natural activity in the Wellsville Mountain Wilderness, likely from Monday. There was also some fresher activity apparent, involving loose sluffs or soft slabs of wind drifted drifted snow. I caught a glimpse yesterday evening of a large hard slab avalanche on the north side of Logan Peak, that looks to have released on a deeply buried persistent weak layer. Fresh wind drifted snow avalanche activity in the Wellsville Mt Wilderness was visible from Mendon yesterday. Dangerous conditions exist on drifted upper elevation slopes. Human triggered avalanches, 1 to 3 feet deep and large cornice falls are likely today. Cornices are likely to break much further back than expected and could be quite large. You could encounter fresh, soft wind slabs or stiff harder old drifts that allow you to get out on them before releasing. Avalanches and cornice falls are most likely at upper elevations on slopes facing north, northeast, and east, but possible on many upper and mid elevation slopes. Avoid wind drifted snow on the lee side of major ridges and in and around terrain features like sub-ridges, scoops, stringers, cliff bands, and gullies. Avalanches of wind drifted snow are likely to fail on a recently buried persistent weak layer. Frost or feathery surface hoar and thick and thinner layers of small-grained near surface facets plagued the snow surface on many slopes before the storm. These are notorious persistent weak layers, and in some areas were buried intact, so the danger of avalanches failing on one will linger for a while. In some areas you could trigger avalanches remotely or from a distance. The storm added a good deal of weight to slopes with poor snow structure and has increased the danger of avalanches failing on a deeper persistent weak layer. Buried layers of sugary faceted snow have probably been reactivated. 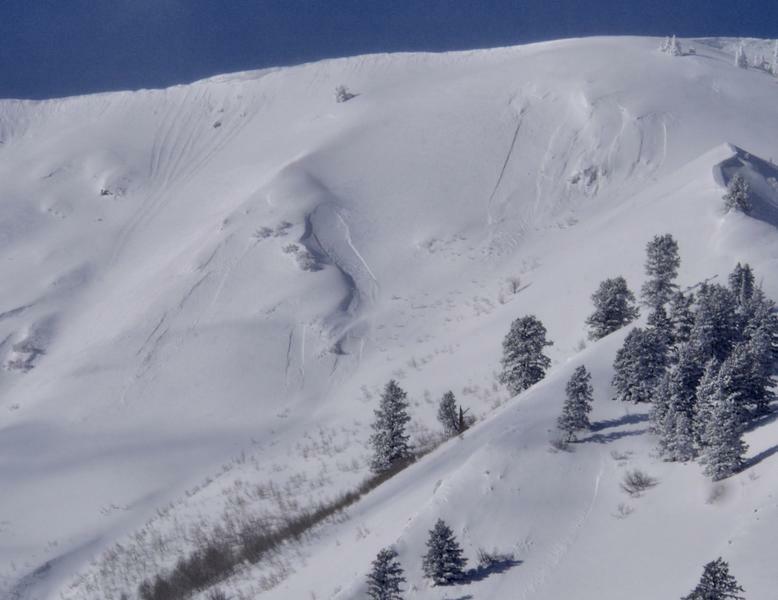 Dangerous, 3 to 5-foot-deep hard slab avalanches are possible for people to trigger, especially on steep, recently drifted slopes with poor snow structure. It is possible to trigger a deep hard slab avalanche from a thin area of the slab. I will update this forecast Monday morning. Now is a great time to practice companion rescue techniques with your backcountry partners. You should check out and use the new Avalanche Beacon Training Park we set up at the Franklin Basin trailhead. Special thanks to Northstars Ultimate Outdoors and USU Outdoor Program for helping us to make this possible. The Beaver Mountain Backside is the backcountry, and it is avalanche terrain. Same goes for the steep rocky terrain adjacent to Cherry Peak Resort. If you leave a ski area boundary, you and your partners should carry and practice with avalanche rescue equipment and follow safe backcountry travel protocols. If you would like to get the daily advisory by email you subscribe HERE. Remember your information can save lives. If you see anything we should know about, please help us out by submitting snow and avalanche observations. HERE You can call us at 801-524-5304, email by clicking HERE, or include #utavy in your Instagram. This forecast is from the U.S.D.A. Forest Service, which is solely responsible for its content. The forecast describes general avalanche conditions and local variations always occur.